The Bluetooth Speaker with Enhanced Sound and Playtime. SoundCore 2 produces outstanding audio from an astonishingly compact speaker (165mm*54mm*45mm). Upgraded 2x 6W drivers blast out rich, clear sound. Bring your music to life with proprietary Anker BassUp technology. Deeper bass ensures a wide, balanced audio range. 24h-hour / 500-song playtime means you can listen all day, and all night too. Note: Playtime varies according to volume and audio content. IPX5 water-resistant rating and dustproof engineering mean you can bring your beats anywhere – from the garden, to the beach. Upgraded materials provide smooth touch, and better grip. Listen for up to 66ft with latest Bluetooth 4.2 technology, while an in-built microphone makes hands-free calling a breeze. No Bluetooth? No problem, an aux port allows you to plug in and play. The Anker Advantage: Join the 10 million+ powered by America's leading USB charging brand. Advanced Charging Technology: PowerIQ and VoltageBoost combine to provide the fastest possible charge up to 4.8 amps or 2.4 amps per port. (Does not support Qualcomm Quick Charge). Certified Safe: Anker's MultiProtect safety system ensures complete protection for you and your devices. Compact Design: One of the industry's smallest ever USB car chargers, featuring two USB ports and an LED light for after dark. What You Get: The Anker PowerDrive 2 (24W 2-port USB car charger, no cord), welcome guide, our fan-favorite 18-month warranty and friendly customer service. The Anker Advantage: Join the 20 million+ powered by our leading technology. Travel Companion: Weighs in at just 5 oz (about the same as a baseball), to keep power on hand—anywhere the journey takes you. High-Speed Charging: Say goodbye to slow, clunky wall chargers, and experience a rapid, tailored charge with Anker's PowerIQ device-detection technology. Upgraded Design: A sleek yet robust finish resists scuffs and scrapes to look newer for longer. 6 bright LED indicators show power levels at a glance. What You Get: Anker PowerCore II 6700 Portable Charger, Micro USB cable (USB-C and Lightning cables sold separately), travel pouch, welcome guide, our worry-free 18-month warranty and friendly customer service. 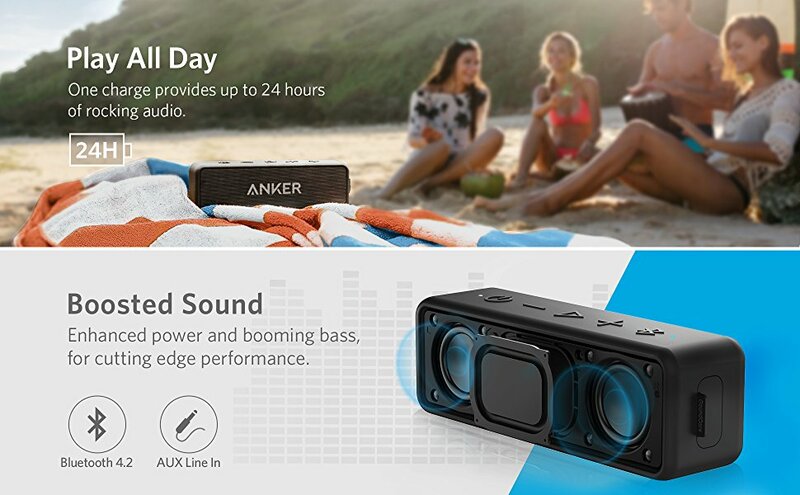 Anker SoundBuds Bluetooth Earbuds (NB10), Secure Fit Sport Sweatproof Wireless Headphones with Enhanced Bass for Work Out, Running, BMX, Cycling and Boxing Perfect Fit for Sports: Flexible hooking design, customizable FitClips and EarTips ensure a secure and comfortable hold through the most extreme training. Water-Resistant: Run in the rain, or sweat it out at the gym. IPX5 water-resistant shell and internal nano-coating provide a double layer of water protection. Powerful Sound: Oversized 12mm audio drivers deliver incredibly clear, wireless audio to push you through the hardest workouts. Advanced Technology: Universally compatible, portable Bluetooth 4.1 headphones work with any Bluetooth-enabled device. Connect effortlessly and enjoy up to 6 hours of continuous playtime. What You Get: SoundBuds Sport NB10 Wireless Headphones, Micro USB cable, 3 pairs of EarTips (S/M/L), 2 FitClips, travel pouch, welcome guide, our worry-free 18 month warranty and friendly customer service. Anker PowerCore+ 10050 Premium Aluminum Portable Charger with Qualcomm Quick Charge 3.0, 10050mAh Power Bank with PowerIQ Technology. The Anker Advantage: Join the 20 million+ powered by our leading technology. Charge Faster: Qualcomm Quick Charge 3.0 combines with Anker's proprietary PowerIQ and VoltageBoost to deliver the fastest possible charge to almost any USB device. High Capacity: Charges the iPhone 7 over 3 times, the Galaxy S6 more than twice or the iPad Air 2 once. Recharges in under 4 hours with Quick Charge input. Premium Design: Robust and durable aluminum-alloy encases PowerCore+'s high-grade components and circuitry. 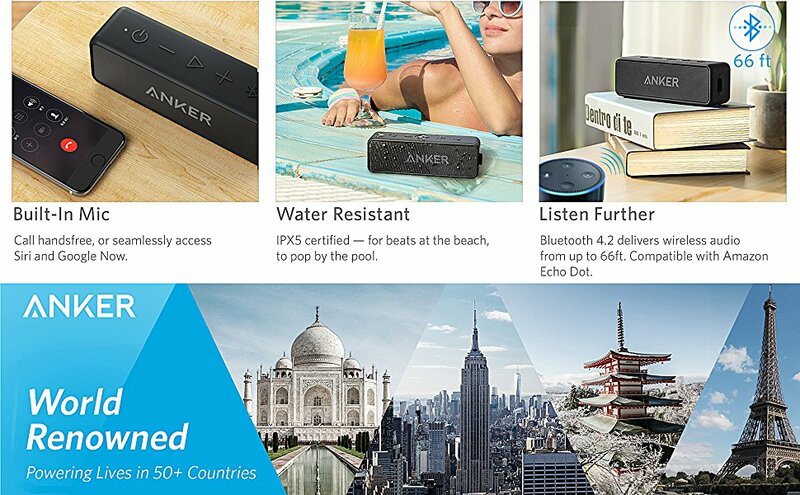 What You Get: Anker PowerCore+ 10050 with Quick Charge 3.0 portable charger, Micro USB cable, travel pouch, welcome guide, our worry-free 18-month warranty and friendly customer service. The Anker Advantage: Join the 30 million+ powered by our leading technology. Upgraded Capacity: The successor to PowerCore 10400—identical compact size but packed with even more power. Charges an iPhone 8 almost 5 times, an iPhone X or Samsung Galaxy S8 3 times, or an iPad Air 2 once. Light and Compact: A super-high 13000 mAh capacity with two high speed USB ports is all contained in a portable charger smaller than a wallet. High-Speed Charging: PowerIQ and VoltageBoost combine to deliver a max speed charge to any device (up to 3A - Qualcomm Quick Charge not supported). Input: 5V / 2A.